Many years ago, Pavlé Nikitovich, my father, saved four Frenchman he had never met before from a Russian death squad. It was a random act of kindness, perhaps a foolhardy act of heroism, but an act that rippled down through time and saved generations of unborn children. As World War II drew to a close, the Soviets invaded Yugoslavia, which had already endured three years of brutal German occupation. After a two-day battle, the Soviets took Belgrade and soon drafted all able-bodied Yugoslav men into the Communist army. Just nineteen, my father walked the docks of Belgrade’s port on the Danube with the other recruits and watched as the Soviets forced the Germans, now prisoners-of-war, to unload Russian ships arriving from the Black Sea. Sometimes the Soviet soldiers would pass around a bottle of vodka and play a macabre little game. They would force the German prisoners to walk up the plank to one of the ships while they took turns shooting. The officers cheered when one of them managed to hit a German in the head on his first try. As the body hit the water, the soldiers would laugh and toast the winner with another shot of vodka. When a new batch of prisoners arrived, the Russian Communists would select the prisoners who had been there the longest and send them off to the firing squad in order to make room for their replacements. My father had already witnessed what happened to German prisoners-of-war. On the day the Soviets marched into Belgrade, he watched from the window of his family’s apartment as more than 300 vanquished Germans walked up to a table where a Soviet soldier armed with a Kalashnikov stood above them and shot them one-by-one through the head. When the pile of dead bodies grew too big, the Russians would move the table. The Communist soldiers, wearing red armbands, then ordered a dozen young local men, including my father, to pick up the dead bodies and throw them into trenches in front of the church. In groups of four, they lifted the cadavers by the arms and legs and dumped them into the trenches, ignoring the brains spilling from shattered skulls and the blood gushing onto their hands and shoes. But what my father remembered most clearly were the pictures and letters sliding from the left-side pockets of the dead soldiers’ uniforms when the bodies bounced and shifted, mementos placed on their hearts to remind them of love and give them courage as they bravely walked to their deaths. My father understood then that the German soldiers were just young men like him, obeying the orders of one dictator only to be murdered by the orders of another. There were no longer good guys and bad guys in those confusing post-war days, merely one horror following another. It was before a scheduled execution day in October of 1944 that a young man in a German uniform approached my father and asked him if he spoke French. Why he asked Pavlé and not one of the other Yugoslav guards is a mystery. Perhaps he had tried others only to receive a blank stare in response. In any case, this was his lucky day. My father spoke fluent French. Pavlé listened as the man, Pierre Ambiehl, explained that he and his three buddies were French, not German, and had been drafted into the German army after the Nazis occupied and annexed the French province of Alsace. 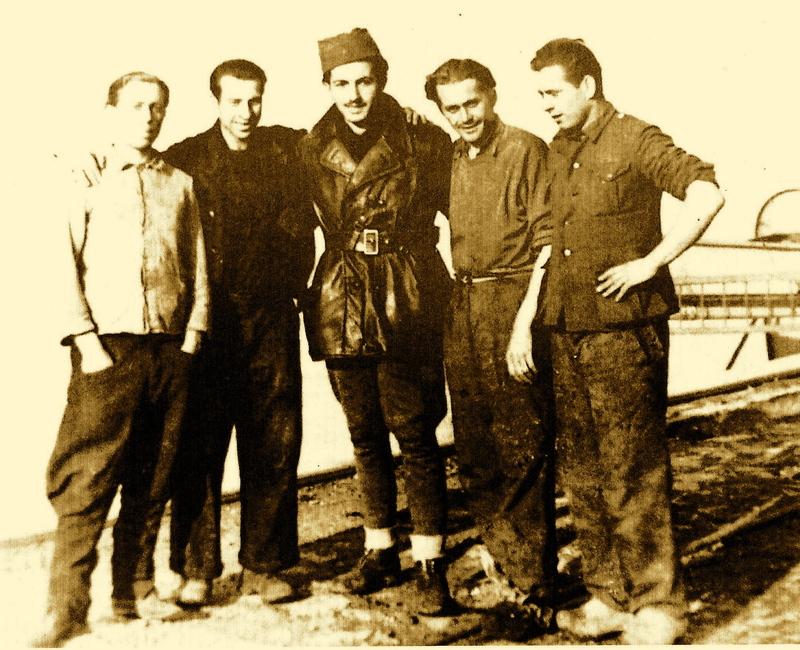 Taken prisoners by the Soviets, they ended up on the docks of Belgrade awaiting death by firing squad. Since none of them spoke Russian, they had no way of telling the Soviets they were French, and thus allies, not enemies. They were scheduled to die the very next day, and Pierre pleaded for Pavlé to help them. Vowing to try, my father went to a Russian soldier he had befriended and told him about the Frenchmen’s plight. The Russian said that since the four had fought with the Germans against his countrymen, they deserved to die. But Pavlé somehow managed to persuade him to ask his Soviet superiors to delay their execution by a few days. Then he did what only the young, the fearless and arguably the foolish would do. He snuck out of the military zone with the French identity cards of all four men and walked to the French embassy, where General Charles de Gaulle had established a delegation. The next morning, two French officials came to the port with all the necessary documents to free the Frenchmen. Right before they left, one of the embassy envoys had the foresight to take a photo of the four liberated friends flanking their hero, my father, a handsome young man with a dark mustache and a hesitant smile. Pierre Ambiehl kept that photo for sixty-five years, knowing only the name of the young man in the middle, Pavlé Nikitovich. Now 84, Pierre asked his son André if he would help him fulfill his dream: to find the hero who had saved his life so he could thank him. As serendipity would have it, André had worked at the Peugeot factory in Alsace for many years alongside his Serbian friend, Stanko Yotsitch, who subsequently moved back to Serbia. He asked Yotsitch to help him in his search. Yotstich told the story to journalist Mirko Prelevitch, who then wrote about it in Belgrade’s “Novosti” newspaper, asking readers to contact him if they knew what had happened to Pavlé Nikitovich, the man in the photograph. Meanwhile, a few months after the Frenchmen were freed, my father and his sister managed to obtain fake documents and escape, first to Italy, then to France, and eventually to the United States. After a few false leads, and a little help from Google, Prelevitch finally found a Paul Nikitovich living in Englewood, Colorado. When my father received Prelevitch’s call and heard the story, he was stunned. While Pierre Ambiehl had lived with the memory his whole life, my father had forgotten the incident until that moment. His brave and generous gesture had truly been a random act of kindness, the kind that changes lives forever, even though at the time it had not registered as heroism to a young man who was merely following his human instinct to help those in need. The story doesn’t end there. André Ambiehl invited my father to come visit the family in Alsace. He flew to France, and on October 27, 2010, attended a special ceremony for World War II veterans in Ensisiem, Alsace. 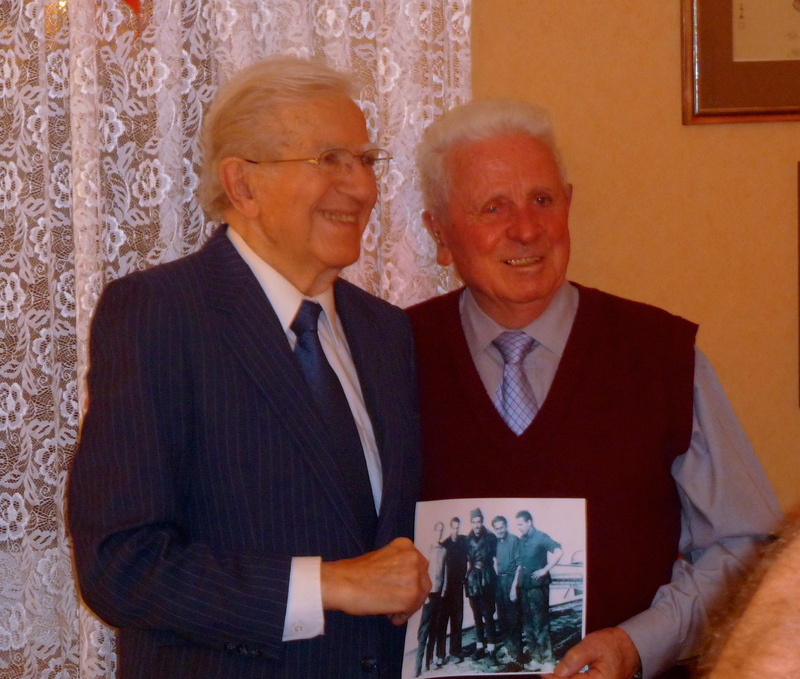 Pavlé Nikitovich and Pierre Ambiehl were the guests of honor, two men whose destinies had crossed decades before and sent ripples into a future that would not have been possible otherwise. My father recently celebrated his 89th birthday. André and his wife have visited him in Colorado several times, and he speaks to them and Pierre often. By choosing to help a stranger, Pavlé Nikitovich left a legacy of life, love, respect and gratitude. And he did it neither for personal gain nor to show off nor to curry favor with his captors. He did it because he is just that kind of man. Thanks, Janet. He really isn’t that tall…they were very short Frenchmen! Thanks, Sara. Now all I need is an audience! But at least I have a handful of smart readers like you, and that I truly appreciate. Très belle histoire que celle de ton Papa. Merci de nous l’avoir fait connaitre . Terrific story and terrific writing, Maia. This sent chills down my spine. Thank you for reading! A compliment from you means a lot. Thank you so much for telling this inspiring story. I am in awe. Wonderful history Maia, sad that more people are not aware of these inter connections of the past and future. This is written beautifully Maia, once again you effortless writing is so easily absorbed. Thank you for sharing. One thing I did not get was in the last picture, which one is Pavlé? Hey Maia, I don’t know if you remeber me, but Evan and I were friends and I used to visit from time to time from Santa Barbara. I was searching online randomly for Evan a while back and came across these writings while I was going through similar stuff with my grandfather. Well written and completely relatable for anyone who has been through it. Hope all is well.